3M 3903 49 in x 50 yd 6.5 mil Vinyl Duct Tape is 3M's general purpose duct tape made from a tearable embossed vinyl backing. 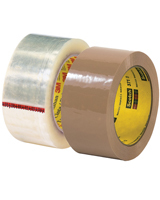 3M ID 70006711777 3M 3903 50 in x 46 m 6.5 mil Vinyl Duct Tape utilizes a rubber adhesive that makes it ideal for medium weight sealing and other general bundling applications. Available is seven colors for organization and convenience. Rubber adhesive is ideal for bonding with smooth surfaces such as metal, glass, plastic, concrete and more.